Rice cakes are made with the entire rice grain, including the bran, endosperm and germ, so they contain all the nutrition of rice. They are low in fat and make a convenient snack. Rice cakes have been thought to be a dieters' snack food, but they may not be effective for weight-loss despite their low calorie count. However, rice cakes do have benefits for general and specific health conditions. Use a calorie counter to find out the exact nutrition breakdown of rice cakes. Southeast Asia, which has been growing rice for nearly 5,000 years, developed the first rice cake. With the health craze that began in the 1980s, rice cakes were in demand as a low-fat snack. From the first tasteless plain rice cake, the availability has expanded to include flavors such as apple cinnamon, caramel corn and cheddar cheese, according to the Quaker Company. To obtain the maximum benefit from rice cakes, eat them in moderation to supply your daily carbohydrate needs in combination with a healthy diet of fruits, vegetables and protein sources. Substituting rice cakes for fatty snacks, such as biscuits, pastries and chips, will help with your weight-loss program. To make rice cakes more filling, you can spread them with low-fat toppings, such as non-fat whipped cream or cream cheese spread, a spoonful of fruit preserves or low-fat hard cheese. For a healthy lunch, use two rice cakes as a base for thin slices of deli-meat, green pepper rings, tomato, avocado or other vegetables and top with melted skim-milk mozzarella cheese. One rice cake contains 35 calories -- 7 percent from fat, 8 percent from protein and 85 percent from carbohydrates. Rice cakes contain 0.4 g of fiber, no cholesterol and very little sugar, according to FatSecret calculations. Nutritionally, a rice cake provides 0.74 g of protein, 29 mg of sodium and 1 percent daily value for iron. In addition, rice cakes contain manganese, selenium, magnesium and tryptophan. 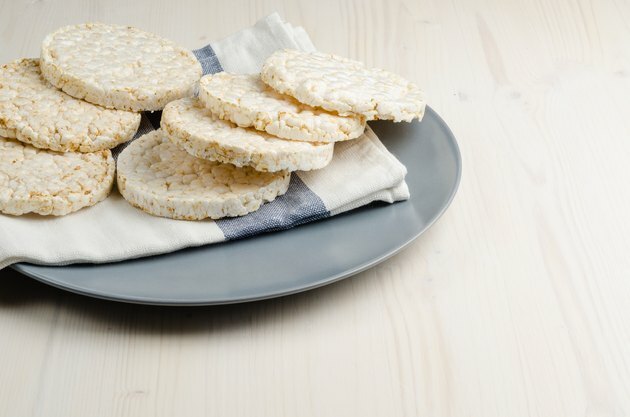 Although rice cakes are low in calories, it is easy to eat too many because they don't make you feel full and can't fully satiate your craving for more food. The glycemic index of a food is a measurement of how fast the carbohydrate it contains raises blood glucose levels and insulin secretion as it's digested. Rice cakes have a high carbohydrate content at 21 g per serving, and three cakes have a very high glycemic index of 100. High-glycemic foods rapidly raise blood glucose levels and create a high insulin demand, which could lead to irreversible diabetes and cause cardiovascular disease, cancer, diabetes and weight gain, warns Oregon State University. J. B. Miller and colleagues at the University of Sydney's Department of Biochemistry conducted a study to determine the glycemic insulin-index values of various rice products, including rice cakes. The conclusion, as published in the "American Journal of Clinical Nutrition" in 1992, was that rice products are classified as high GI food. Therefore, rice cakes are not a good choice for diabetics. Because rice cakes are low in fiber, they are ideal for low-residue diets, which consist of foods that are easily digested by your body. Eating 10 to 15 g of fiber per day will help slow down bowel movements to help conditions such as diverticulitis, Crohn's disease, ulcerative colitis and bowel inflammation. Often a low-residue diet is necessary after certain kinds of surgery, such as an ileostomy or colostomy, according to National Institutes of Health. Grains are a good source of carbohydrates, various vitamins and minerals and fiber and are low in fat. However, people with celiac disease often find it challenging to eat enough grains because many contain gluten, which can cause the immune system to trigger symptoms such as diarrhea, abdominal pain and bloating, explains Dr Michael Picco, M.D. from the Mayo Clinic. Rice cakes provide a good alternative to gluten-containing snacks. MayoClinic.com: Celiac Disease Diet - How Do I get Enough Grains?